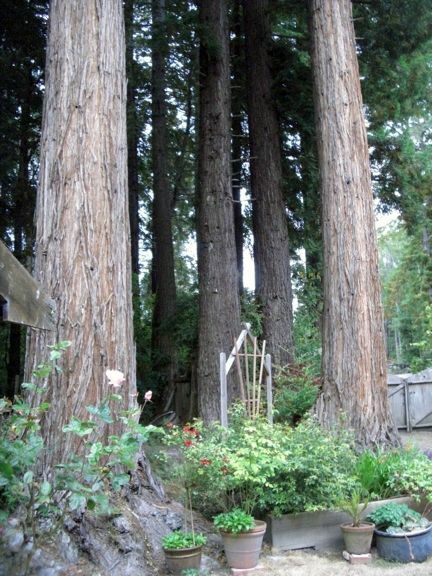 The stately coastal dominate dendrological feature, Sequoia sempervirens rises above the canopy of other competing conifers to majestically outreach the competition for the sunlight it needs to prosper. The fog belt of the California coast is its habitat, inland to about 30 miles, from the Oregon border to the Santa Cruz mountains. Bark is thick on old trees. The trees are straight and without lower branches until many dozen feet above the forest floor. Older individuals have been measured at 20+ feet in diameter and over 360 feet tall. It is the tallest tree in the world. The oldest specimen, whose rings have been counted, is estimated to be 2200 years old.